Košice Night Run lured thousands of visitors to the city center on Friday (7 September). The reasons were various, but the common reason was clearly the joy of the run. The runners and the fans who did not disappoint this year and created a perfect live scene, all enjoyed the run. The seventh year of Košice Night Run was in the spirit of several "small" records. For the first time in the history of the run, more than 1,000 runners completed 10 km in less than an hour. Also interesting was the fact that the organizers were forced to close the registration on the eve of the event due to capacity constraints. Third of the records also accompanied the highest number of musical podiums, totaling up to 17, those were enjoyed by all lovers of dance music, jazz, funky, folk or chamber music.The runners were also encouraged for better performance energetic temperamental drummer band Campana Batucada, who has been the part of Košice Night Run since the beginning. 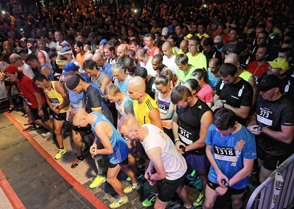 The seventh edition of the popular night run begins in less than 24 hours. The capacity of the event was full on Thursday evening, REGISTRATION of other runners was STOPPED. The organizer was forced to take this precaution due to capacity constraints for the first time in the 7-year history of the KNR. At the same time, we are very happy that the KOŠICE NIGHT RUN event is being supported by more and more fans. Registrations of winners from the competition in ELKEM are to be completed personally, at the presentation site. Hundreds of runners will get together on the track in Košice's historic center on 7th of September. Sports enthusiasts, recreational runners and fans all belong to the Košice Night Run, and you can be part of it too. The run with a unique atmosphere will blow into the center of the East not only the sport spirit, but also an attractive program for visitors. Everyone, even the smallest, will enjoy the track (10K) which is leading through the historic center. Ideal start of the new school year is also planned for children and pupils of primary schools, children run one circuit (5K). The Košice Night Run is not a novelty in the East of Slovakia, the popular sporting event has its permanent place in calendar of many runners. Košice Night Run will be back in metropolis of East in less than two months, be part of it and register with friends today. The first Friday in September will belong to runners and their fans. The seventh year also promises a track in center of Košice accompanied by fans, music podiums along track, original running jerseys and a medal for everyone who reaches the finishing line, regardless of the time. Lovers of sport and healthy lifestyle have recently conquered the Košice airport runway and their running calendar announces another significant event. Kosice Night Run is writing its seventh chapter, and you can be part of it. Registration for Košice popular night race has started and you can already secure the place and join the hundreds of athletes who will be at start line on 07.09.2018. Kosice Night Run traditionally dominates the historic center of Košice after dark and sports lovers can once again enjoy a 10 km long track. Characteristic of Kosice Night Run is an attractive music program, which organizers prepare this year too. Košice night run is for runners - but also for all cheering relatives and friends. By early registration for Kosice Night Run 2018 you will also receive a discounted starting fee. Registration for the new edition of Kosice Night Run takes place online till 07.09.2018 (inclusive) at www.kosicenightrun.sk. Friday night in the east was really hot, not only because the temperatures were nearly in the thirties. The night runners met at the sixth year of the prestigious run: the Košice Night Run 2017. Exactly at twentieth hour, more than 1,600 athletes were running on Main Street, including children who had run a single circuit. The runners started again at the Lower Gate, but a ten-kilometer route was rotated this year, also spiced up by the run alongside Legiotrain, which was specially opened in the late hours to be enjoyed by visitors to the city. Familiar atmosphere was also complemented by musical stages that the athletes encouraged for better performance. In the center of the city, the local artists, prestigious DJs and leading artists secured their place.